There are many versions of this game produced by Disney as this was a very popular property for the studio. 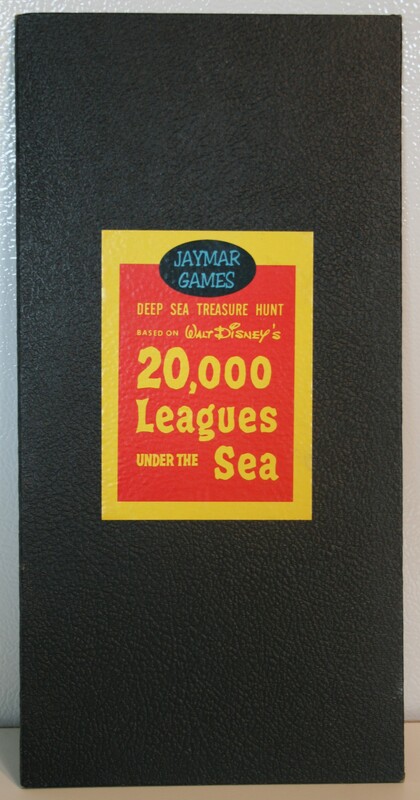 This version is a standard board-playing style made in 1954 by Jaymar Games. Speaking of the artwork, as usual, some artistic license was taken with the images used. For example, there are two different types of underwater suits depicted on the box cover, when only one style was used in the movie (Editor’s Note: Thanks to a knowledgeable reader, Nautilusnut, we have new information about these suits. Please check the comments to learn of their correct use in the film.) Also, this game is based on finding treasure, when only two characters in the movie sought treasure, and this was only a sub-plot in the original movie. However, this in no way detracts from the fun of the game! Again, some license had to be taken to make the game work. The object is to submerge your diver 20,000 leagues (or 60,000 miles) beneath the sea. This is impossible! The maximum depth of the sea is approximately 36,200 miles. 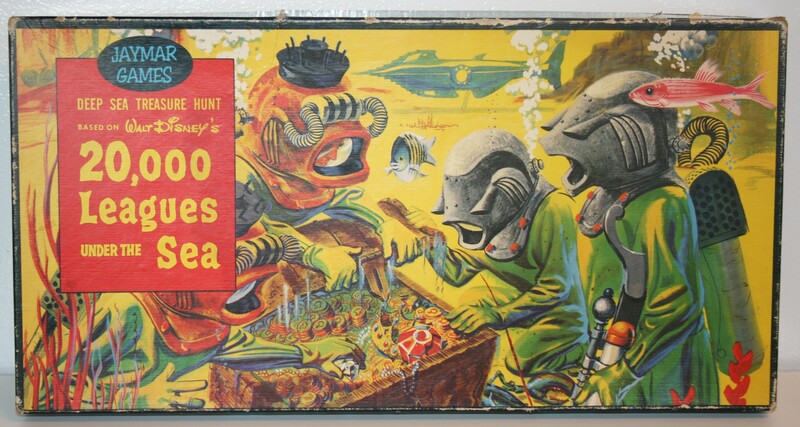 So unless the diver is going to dig his way into the ocean floor, he isn’t winning this game! That’s a very colorful Nautilus! I picked this game up for just $15.00 CAN because it has some damage issues on the box. The rest of the game is in very good condition with all of the parts present. I hope you enjoyed this post featuring a vintage Disney game. Welcome to this month’s Blogorail Orange Loop. Today we are sharing some of our favorite architectural details at the Disney Parks. Spaceship Earth stands proudly over Epcot! Hello everyone, and welcome to this month’s Magical Blogorail Orange Loop! Today we are taking a look at some of the incredible architectural details that you can find at Walt Disney World and the rest of the Disney Parks! For me, I’m focusing on one of my absolute favorite attractions at Epcot (or any Disney Park, for that matter) — Spaceship Earth! From a technology perspective, Spaceship Earth combines some incredibly cool — I would almost say geeky — stats as well as some technology from yesteryear. Let’s dive into them just a little bit, shall we? 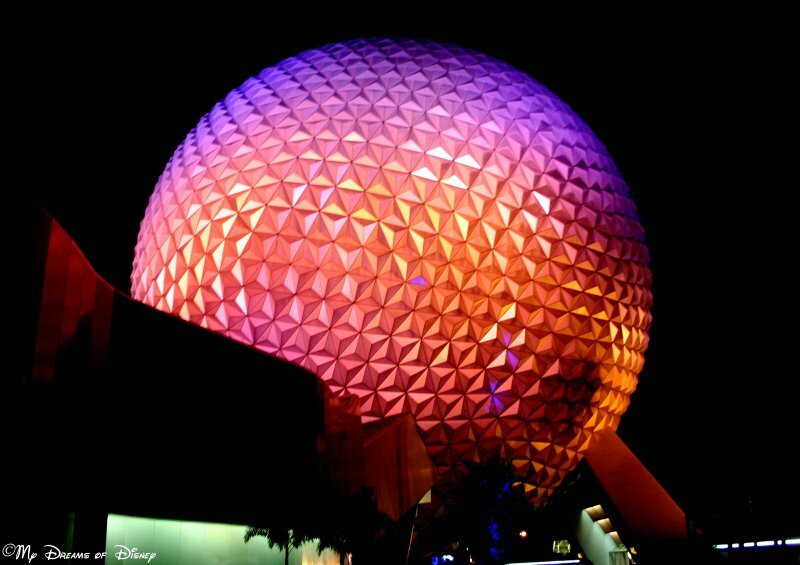 Spaceship Earth is 180 feet tall, and weighs in at about 16 million pounds! The skin of Spaceship Earth is made up of 11,324 aluminum and plastic-alloy triangles! Did you know that the water from rain that lands on Spaceship Earth never falls to the pavement below? There is a special system in place that takes the water and drains it into World Showcase Lagoon! Spaceship Earth has a diameter of 165 feet, a circumference of 518.1 feet, and a volume of 2.35 million cubic feet! As part of the attraction, though, did you know that Spaceship Earth incorporates an old 1A2 key system phone into one of it’s props? Now that’s old school! The scenes inside the attraction are my favorites! For me, though, more than the numbers, more than the technology, more than the incredible photo opportunities, what I really like about Spaceship Earth is the attraction, the ride itself. Somehow, knowing that you are climbing into the belly of the “big golf ball” and heading all the way to the top is just really cool to me. Reliving all of the exploration of how communication has adapted over time is really neat, and the sites, smells, sounds of it all just bring you there as if you are experiencing it firsthand. That’s why I like Spaceship Earth so much. Man, I miss this attraction! 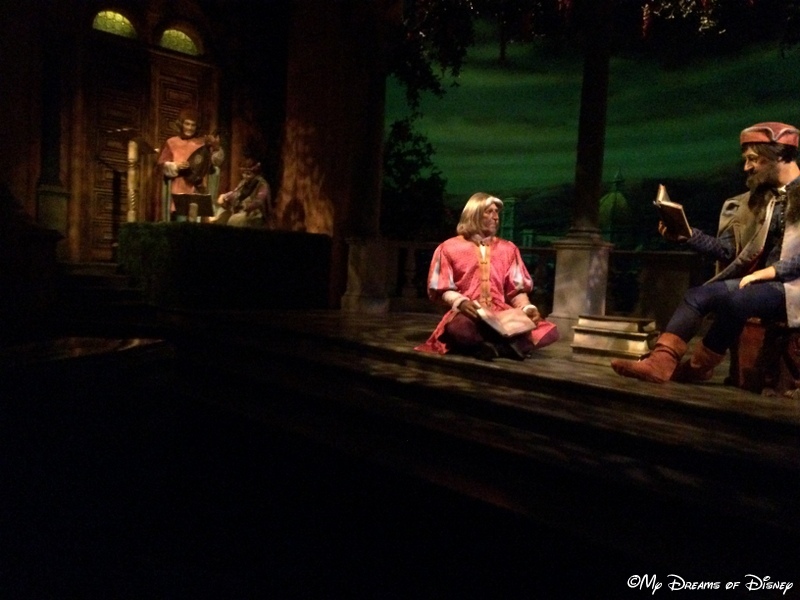 I hope you have enjoyed our look at Spaceship Earth! Tell me, what do you think of this attraction? Please let me know in the comments, and thanks for stopping by! Now go check out the rest of the loop — we’ve got some great posts for you to read! Our friends over at Love Our Crazy Life have asked some of their blogging friends (like me) to participate in a Blogging Challenge. So for four weeks in April, on every Monday morning, I will be covering a different Disney-related topic. You can click the link above to find all of the other participants and their entries. Enjoy! I struggled with this topic, so it was fortunate for me that it came last in the series! I thought of doing a comparison of Disney then and now, but that would take too much time. I thought of doing a pictorial of me in 1972 at Walt Disney World versus me in modern times. But I have too few images for such a post. So what to do? Why not do the unexpected, or inexplicable? So welcome to my post that looks at the back side of Disney! But time ran out and Walt saw the altered version. And loved it! So the whole thing was built around the wrong way. So when you visit Disneyland and take a picture of the front of the castle, your picture will turn out backwards! I’m constantly amazed at how many times Disney is able to get us excited about simple and common things. Millions of us take pictures of trash cans just because they are color-coded to the Land they are in. Many of us enjoy a bus ride, even though we have to wait too long to get on one and they take forever to get anywhere! And then there is the back side of water. A simple gag line from a corny attraction has caused more cameras to click and more people to groan than any other naturally occurring substance in the World! Each of the ships in the Disney Cruise Line have a distinctive character tableau attached to the back. Historically, most sailing ships would stick a figure on the front, such as Pirate ships. But Disney just had to be different! They are almost impossible to see from the ship themselves, so take your pictures before you board. I guess Disney just wants to give those ocean-going tailgaters something to look at! OK, that’s just rude! But I’m sure Mickey is just being playful as he takes a backwards peek at us. There are many different designs in this theme, showing us the back of characters instead of just another view of the more familiar fronts. But be careful: You may not know if you’re coming or going when wearing one of these! And there you have my look back at the back side of Disney. I wonder who else would have thought of this angle for Looking Back at Disney?! Mother Goose nursery rhymes have been told and retold too many times to count, but this retelling gives the familiar tales a Disney twist. Each verse is accompanied by images of beloved Disney characters, both well-known and obscure. 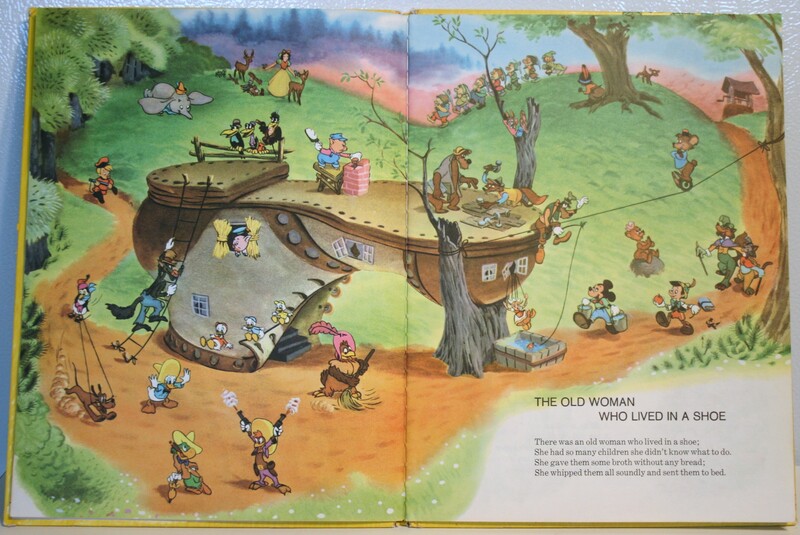 The artwork is attributed to the Walt Disney Studio, with no single artist being credited. It’s always cool to see so many Disney characters together! 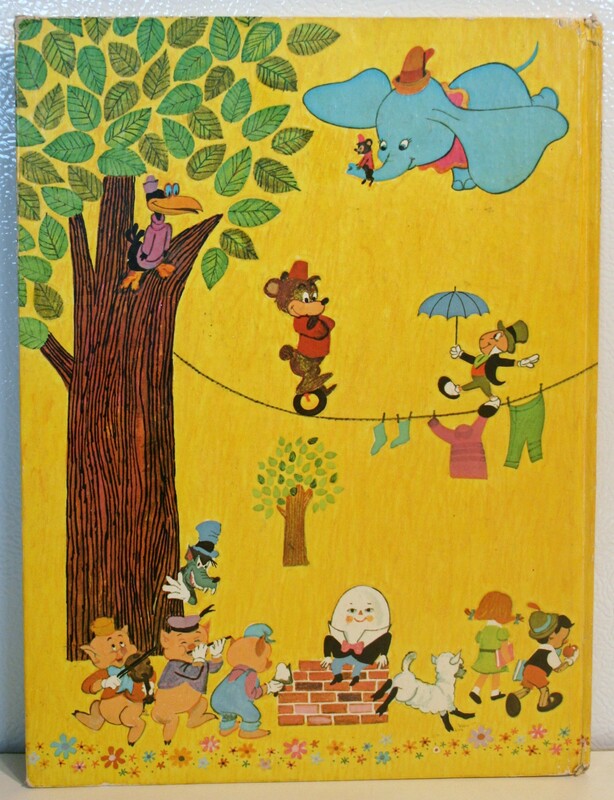 Above we have a collection of favorites like Mickey Mouse, Donald Duck, and Pinocchio alongside vintage characters like the Three Little Pigs/Big Bad Wolf and Clara Cluck, and then obscure characters like Bongo and Pablo (the penguin). The Old Woman needs to add a boot annex to her shoe! I thought this page was neat because it used each of the seven dwarfs for a different rhyme that basically fit their personalities. The book has many references to the Song of the South. 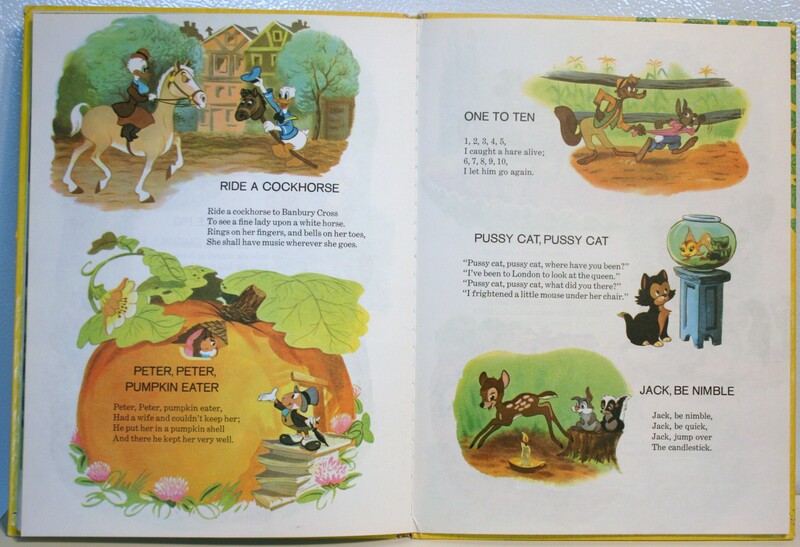 The rhyme One to Ten depicts the only time Br’er Fox would ever consider letting Br’er Rabbit go! Not many Disney fans remember little Bongo and his girlfriend, the couple from the package film Fun and Fancy Free. This was a character that didn’t quite make it but did show up from time to time in books like this. This page caught my eye. Not only are characters from Song of the South featured again (Yea!) but Snow White makes an appearance in a color-variant of her signature dress. 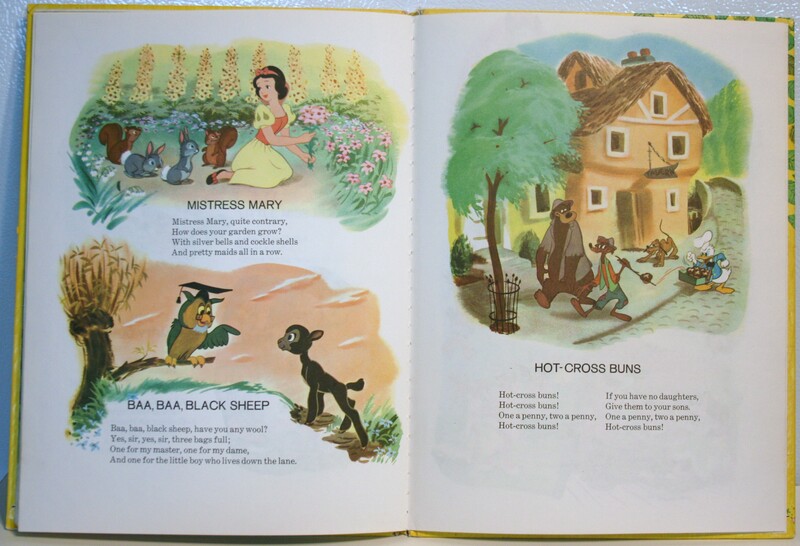 Lastly, the little black lamb from So Dear to My Heart makes an appropriate cameo in Baa, Baa, Black Sheep! The rhymes are basic and well-known, but for very young children, everything is new again! The artwork alone, with the Disney touch, is worth adding this book to your child’s collection. I would give this book a 4 out of 5 Stars. Again, story wise, there is nothing new here. But for the Disney fan, seeing beloved characters portraying favorite Mother Goose characters should be worth a look. You can find a reprinting of this book on Amazon as of the date of this post. This particular copy is the eighth printing by the Western Publishing Company from 1973. It is part of the Golden Book series. You’ve spent months planning the perfect Disney vacation. You’ve accounted for every possible contingency. You’ve packed enough stuff to outfit an expedition to the real Mount Everest. You’ve psyched your entire family into a Disney-induced preoccupation. And now you’ve arrived at your chosen Disney destination. And there’s weather. Tut, tut, it looks like rain! Nothing says ‘fun’ like riding an attraction in a deluge of Biblical proportions. We like riding Splash Mountain or the Grizzly Bear Rapids to get wet, but Autopia or The Magic Carpets of Aladdin? Not so much. Here’s what to do: Do not leave the park! Everyone else will, so this is the perfect time to do indoor attractions that usually have long lines. Also, it’s a great time to shop because the stores will be less crowded, and the Cast Members will be able to give you better attention. Grab a bite at that busy restaurant that you can never get reservations for. In short, continue to have fun. Oh, and wear a Mickey Poncho! Those who live in Florida have a saying: Don’t like the weather? Wait a few minutes, it’ll change! Remember earlier when I said you planned for every contingency, and packed everything you’d need? Well, that’s great. But if you get up in the morning and it’s sunny, so you wear shorts and a t-shirt with no coat, but two hours later it’s cloudy and windy with a wee nip in the air, followed by one of Florida’s famous downpours, followed minutes later by scorching temperatures, you quickly realize that this weather condition isn’t much better than a full rainy day! Here’s what to do: Watch the skies. Sometimes the weather is merciful and gives a few moments warning of what it has planned. Learn to roll with the punches and deploy that famous sense of humor of yours. You have one of those, right? It won’t help! Hang onto your Mickey Ears because it’s about to get blustery! This isn’t one of the worst weather conditions you can face at Disney, but it does present some challenges. You may want to rent a locker and stow the hats and other loose articles. Do up the coats. And get ready to acquire a taste for dust! The main problem with this weather condition is that some rides may be shut down, such as Characters in Flight in Disney Springs. Here’s what to do: Just keep having fun and try to make a game of dodging debris. Now we’re getting closer to the ideal weather conditions for a perfect Disney vacation! When the day is overcast, but not raining, usually the temperatures are moderate. The sun isn’t beating down on you and the blonde-haired person in your party isn’t a bright red yet. Here’s what to do: Go on as many of the slower outdoor rides that you can. Driving with the top down (the cars, not yours) on The Tomorrowland Speedway for example is much more enjoyable without depleted-ozone induced cosmic rays killing you! It may also be the time to rent that watercraft and get out on the Seven Seas Lagoon. If it’s windy too, don’t rent a sail boat or you may end up in another State! Ding! Turn me over, I think I’m done. California and Florida can get pretty hot when the sun shines in the middle of Summer. So you may think that this would be the worst time to be at a Disney park, right? Wrong! Here’s what to do: You can use the heat for an excuse to scarf down a dozen Mickey Bars. You can ride a water-based attraction and get soaked. No problem, you will be dry by the time you get to the next attraction. If all else fails, you should be able to talk your family into some pool time back at the Resort. And trust me, you’ll quickly learn how to bathe in a drinking fountain. Also, bright sunny days provide the best conditions for taking awesome photographs! Sure, you’re going to suffer. But enjoy the sun while it lasts. Remember, you’ll be back at work in the middle of Winter before you know it! So there you have it, my Top Five list of weather conditions that you may encounter at a Disney park. And maybe I’ll see you there some day. I’ll be the one shaking my fist at the sky and screaming ‘WHY’ over and over again!